When I first started teaching social media to writers, I was new thus insecure. Often, I’d give advice like, “Well, if you don’t like it, don’t do it.” Bad advice. Hey, I’m learning and growing, too. There are a lot of writers out there only doing what they enjoy. That is the masses, the average. This advice to only do what we enjoy might have flown four years ago (though barely). These days? Discoverability is a nightmare for all authors. If we want to do this “writing thing” long-term and be successful? Thing is, I want that job where I never have to do anything I don’t enjoy, but it doesn’t exist. It’s Sasquatch. I don’t enjoy payroll or calling my accountants. I enjoy doing taxes even less. Writing is fabulous. It’s the best job in the world. But those who think writing is simply being an artist? Creating? And drinking copious amounts of coffee? There is a word for that; “amateur” (though “wanna-be” can be used as a synonym). Granted, there was a time when all writers did was write. They drank whiskey by the gallon, chain-smoked and stayed in their hole until it was time to hand their nicotine-stained manuscript to their agents and editors. Back then, writers never had to worry their pretty little heads about all the business stuff (they also suffered a 93% failure rate as late as 2006, per Book Expo of America statistics). The climate has changed. The world has changed. In 1980, we didn’t have to know how to use a computer to land a premium corporate job. Now, try finding employment at The Gap without possessing even basic computer skills. Choosing traditional publishing will not free us from the un-fun stuff. Yet, I will admit that, if we choose to go indie or self-publish, we must accept that more un-fun stuff will go with the territory. Yet, it’s the price we pay for being paid really well to do what we love. I used to try to placate these writers and encourage them to embrace the new freedom and power a social media platform gives authors. Now? There are too many writers willing to do the hard stuff. There’s a lot of reasons why this business isn’t for everyone. And yes, maybe I sound mean, but you have no idea how many times I use that same phrase on myself. When I catch myself whining (and, yes, it happens) I remind myself that there are plenty or people willing to fill any vacuum I leave. The hard truth is there are talented, hard-working authors who will gladly take the readers we leave on the table because we only want to do what we find pleasant. ….yet failed to see what he was doing wrong. ***Whining keeps us from honestly evaluating our processes. First of all, professionals don’t whine. Secondly, social media is only as good as our plan. It was clear to me that this writer was making a LOT of obvious mistakes. Whining—no one likes a whiner. Though I suppose they do. This guy was sniveling as if no one ever responded to him, yet this dreadful post had over 310 shares when I stopped by. Misery loves company (but misery clearly wasn’t translating into sales). Lack of Focus—we can’t be everywhere. WANA methods are about selecting the right social platform for our audience, then having laser focus. More Writing—an HOUR on Twitter a DAY? Seriously? O_o. I’m good to have an hour on Twitter a WEEK. Less can be more. Understanding how to properly use social media can save precious time, which should be reserved for doing the most important aspect of what we do…WRITE MORE BOOKS. Study all the indie successes and most became successful AFTER BOOK THREE. John Locke didn’t sell a million copies of ONE book in five months. The same is true for traditional authors. Flukes aside, most successful traditional authors gained market traction at or after BOOK THREE. We all whine. I do. I do it a lot less and have become better at catching myself early in the process. Whining is negative. Whining sees only problems, not solutions. It drains valuable creative energy. It discourages us and stands in the way of progress. If something is hard, look to mentors and resources. Sometimes we don’t like doing something because we’re afraid of it. Why are we afraid? We don’t understand it. Ignorance breeds fear, often irrational fear. WANA rests on simplicity and timelessness. 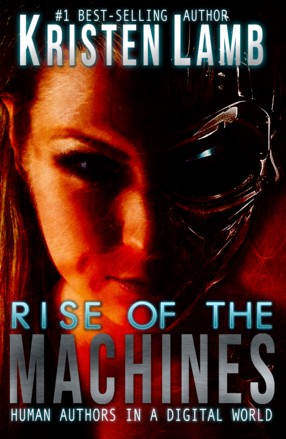 Rise of the Machines–Human Authors in a Digital World is designed to make social media fast, effective and fun. It’s designed to harness the creative personality, not change it. Because of this, WANA methods have been responsible for selling hundreds of thousands of books and elevating unknowns into record books. Right now, I am reading all kinds of business books and books on strategic planning and management. Why? Because I was WHINING! I caught myself mid-whine, then decided to look for solutions instead of spinning the Wheels of Self-Pity. e to find solutions once you faced what scared you? ANNOUNCEMENTS: I have a class coming up SOON, Creating Conflict and Tension on Every Page if you want to learn how to apply these tactics to your writing. Use WANA15 to get 15% off. Also, August 21st, I am running a Your First Five Pages webinar. Bronze is $40 and Gold is $55 (I look at your first five pages) and use WANA15 for 15% off. The webinars are all recorded in case you can’t make the time and a PDF with notes will be sent to you following the class.